T-minus 9 days until Valentines day! Are you a v-day fan or no? To be honest, I don’t really loveeee it, but it is a fun excuse to buy a new skirt and get my man to take me out! So what are YOUR plans for this valentines? Date night? Girls night out? Night in with your dog? Whatever your plans I’ve got you covered friend. Let’s talk about this outfit. Happy weekend friends! So if I’m honest, I haven’t had the best week. My anxiety has been horrible, I’ve been feeling super sick, and it’s the week before finals (AKA every essay, project, test is due!!!). But I’m trying really hard to remain positive, spending lots of time in prayer, and finding beauty in my struggles. And I’ve been setting time aside to focus on my blog content even in the madness, because honestly, this platform brings me so much peace. I’ve been receiving some really sweet comments about my social media posts lately, and I appreciate all of the kindness more I can even express. If you’re here reading this, I just want to let you know how much of an impact you have on me. I’m so grateful for your readership, love, and support. 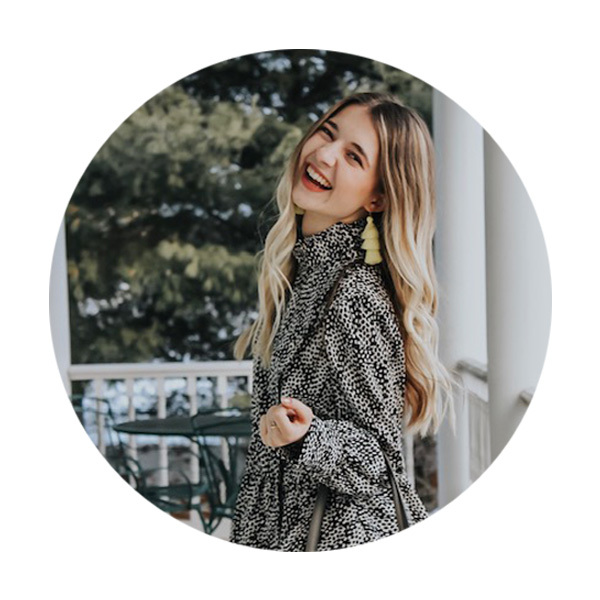 I hope my blog can bring something positive into your life at some point or another too, whether it’s a simple gift idea for someone you love, or a message you needed to hear. Alright, enough of that sappiness! Tonight I’m so excited to be sharing yet another gift guide with you guys, it’s by far the most requested one, a gift guide for him (whoever he may be!). I’ve rounded up a handful of gift ideas for any of the guys in your life. I think I’ve included a good variety of ideas for boyfriends, brothers, friends, or dad’s! If you’re a girl reading this, you’re probably rolling your eyes right about now. And let me just say, girl, I KNOW. But if your brother or bf loves Fortnite (even if you don’t!) and likes goofy gifts, they will most defintely get a kick (pun intended) out of these socks! I have a couple guys on my list that I’m planning on snagging them for, just for the laugh! This may be my favorite item in this gift guide! How cool is this personalized docking station? And what are the chances the men on your list already have one of these? I don’t think any of the guys in my life do! But this super cool gift would look great on any guy’s desk, side table, or in their bathroom, plus it has actual functional use! How funny is this mug? I think this is such a fun little gift for any guys on your list who love to golf! What guy doesn’t need a good pair of slippers? I love this pair from my personal fav slipper brand, Minnetonka. They are so soft and warm, but also have a hard sole for walking out to get the mail or let the dog out! They come in four colors! Does your guy pack all of his toiletries in a plastic bag? Mine does. A new (or fist time) toiletry bag would be the perfect gift for any guy who travels often (or even if he doesn’t!). I love the look of this under $15 one from Target! I happened upon this item when I was browsing Target’s website, and I love the idea behind this! The Handsome Man Grooming Can has a variety of men’s grooming items (with hysterical names) for the “hard working, dapper gentleman.” PLUS, the brand gives a portion of their proceeds back to veterans in need! Let’s be real, chances are some of the guys on your list only have ONE pair of lounge/pj pants. And they may or may not (but likely do) have holes in them. This pair from Target has awesome reviews, the material is comfy, cozy, but not TOO warm! How awesome are these bottle openers!? These super manly bottle openers would make such a cool gift or stocking stuffer. You can snag one shaped like any of the 50 states! Sherpa isn’t just for girls! This sherpa shirt jacket from Old Navy is incredibly soft and warm, super manly, and totally perfect for any guy IMO! It’s lightweight but lined in the inside for extra warmth. It comes in several colors, but the black/red plaid is my fav! Did I give you some gift ideas for the guys in your life!? Or if YOU are a guy, are you adding any of these ideas to your own list!? I hope I could help! Happy weekend friends, Jesus loves you! I hope you guys love this round-up and consider purchasing a gift or two from one of these retailers this holiday season! This beautiful brand provides women around the globe full time work, fair wages, access to safe working facilities, and health care services. They have a huge array of gorgeous items perfect for gifts! I especially love their candle selection. This shop with a purpose also supports women in need throughout the world. They currently help support 4,500 artisans and their families! They have a gorgeous selection of jewelry, including these earrings, and a handful of other goods as well, all made by artisans across the globe. Being the coffee-fanatic I am I was especially excited to come across this brand. Ground & Hound’s mission is to support organizations who give dogs a “second chance.” They have a diverse selection of coffees in addition to coffee accessories and apparel! This “sustainable suds” based company sells soaps, scrubs, and other bath supplies with a purpose. Their mission “buy a bar, give a bar” has provided over 1 million bars of soap and 4 wells to areas in need in Haiti. This diverse online shop, based in Chicago, prides themselves in finding collections that “do as little harm as possible” by only carrying products that are eco-friendly, fairly traded, and carry a social mission. The shop carries accessories, food items, and home products. With every purchase this popular stationary store gives school supplies back to school systems in need in the US. I thought these pencils were adorable, but they have a huge assortment of fun stationary and supplies! I was so excited to come across this organization, I think their mission is so beautiful! The company repurposes old keys, stamping them with inspiration words, and making them into pieces of jewelry. They encourage those who purchase their products to one day pass their key on to someone who needs the message stamped on the key more than them. In addition, the company works to provide jobs for those in need. To date, they have created 143,421 hours of work! Last but not least, Miscoots Outfitters sells cozy winter accessories to support the homeless. With every item purchased, an equal quality item is donated to the homeless. Beyond that, they also work to employ homeless individuals within their company! Yay yay yay!!! 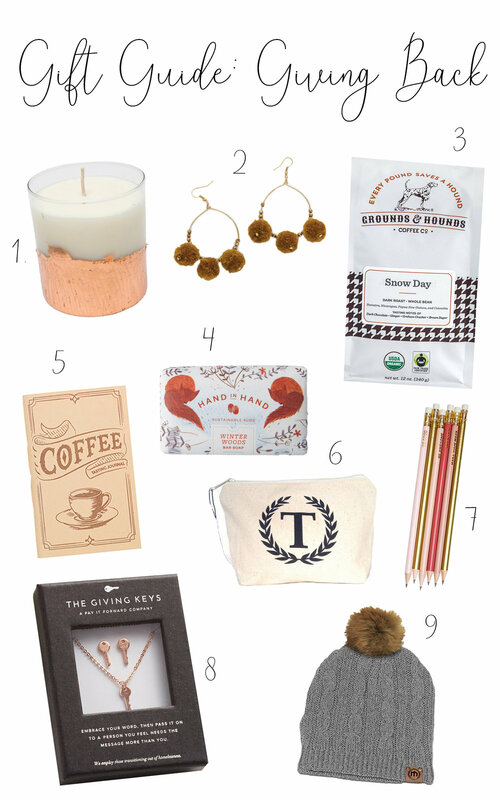 The first gift guide of the season is here! I am so excited to be sharing this with you guys today because it officially means Christmas content has begun! I’m working hard to pump out as many gift guides as possible this year, so if there’s a particular category, store, etc. you would like a gift guide on drop a message in the comments below! 1.) Walmart Light Weight Sherpa Throw $8.88-$10.88: This blanket is incredible for the price and such an affordable, yet perfect gift for anyone! (I’ve seen so many just like it at other stores for double or even triple the price!) These gorgeous little blankets are actually pretty big and CRAZY soft. So online only the Ivory and Grey colors are under $10….but in the store near me they were all priced at $8.88! (Anddd let’s be real, under $11 for this blanket is a STEAL!) I have one in Ivory, which also has gorgeous gold specks that make it sparkle, perfect for the holidays or adding some glam to your space any time of the year! I’m also definitely eyeing the Blush shade! Might have to go snag another!! 2.) Forever 21 Marble Hoop Earrings $7.90: Tortise and marble hoops have been SUCH a trend this season. I’ve seen tons of higher-end options that I’ve loved, but just couldn’t justify spending $40+ on a statement earring. These gorgeous hoops from F21 are so beautiful and a great way to achieve this look for WAY less! I ordered mine a couple days ago and can’t wait to get them in the mail! Would defintely make a great gift for any fashionistas in your life! 3.) Target Rose-Gold Cuff Bracelet $9.99: Yet another gorgeous piece of jewelry! I wanted to include a statement bracelet like this one in this round-up as they are also so on trend lately, and look gorgeous with new year’s outfits! This rose-gold cut out version from Target is priced just right, but looks way more expensive! 5.) Scrunchies $5.99: I’ll be honest, I probably wouldn’t give this as a stand-alone gift. But if you are needing stocking stuffers or one extra item to throw in with your gift for any lady in your life, scrunchies are such a staple! I’ve recently transitioned to pretty much only using scrunchies since they don’t damage my hair or give me a headache like elastic hair ties do! These simple black ones are my fav! 6.) Soap & Glory Hands Yule Love Set $6.99: This set is on my Christmas list! Soap & Glory’s Handfood is the only lotion I use on my hands! I’m super picky with hand lotions, I hate when they take forever to soak in and leave my hands feeling oily for the rest of the day. Handfood soaks in SO fast, is super moisturizing, and doesn’t leave an oily residue AT ALL. I love these travel size tubes to throw in my purse, on my bed-side table, and in my car! Plus, this set comes with two new christmas scents! 7.) KL Polish $9.50: Similar to the lotion above, this is the ONLY nail polish I have used on my nails over the last year! (Except for about a month ago when I actually got gel done at the salon…maybe you’ve noticed them grown out and still on. HA!) KL Polish is created by one of my favorite beauty guru’s Kathleen Lights, and they are fantastic quality. I swear they will last upwards of 2 weeks with very minimal chipping! Plus, she has so many unique colors! The shade shown above is Zoey, I also love Caramello (mustardy yellow), Gumption (deep blue), and Chloe (army green)! 9.) Target Letter Makeup Bag $5: I feel like you can truly never go wrong with a cute little makeup clutch like this one! I love the gold design and the fact that it comes in all letters of the alphabet. For just 5 bucks this would be perfect to throw some scrunchies, a bottle of KL polish, and those trendy hoops in for any girlfriend! Alrighty that’s all for today! Will you be snagging any of these picks as gifts for any of your friends or fam!? I know I will be! Happy Friday friends! To make room in my schedule for gift guides, I’ll be pressing pause on Friday Favs until after the holidays! Check back tomorrow for an Instagram outfit round-up and a few weekly favorites though!